Home / Analysis and Strategy / Business and Marketing / Flipkart going App only is a bad idea. My thoughts! Flipkart going App only is a bad idea. My thoughts! Myntra has already gone App only. Their website now only displays some offers and redirects users to apps. Flipkart is talking of doing the same- shutting down the website and staying focused on app only. Some geeks are already talking that internet on laptop and desktop will soon be history and everyone will be using only mobiles and tablets for connectivity. May be I am a bit old fashioned, born in the 80s. But I have some points to make in this regard. Do read and share your thoughts. 2. I am not an impulsive shopper. Shopping is not something that needs to be done urgently on the spot. If I want to buy something, it can certainly wait till I go home and access internet on a wide screen device. Apps are ideal for things that need to be done on the move- maps, mails etc. 3. Broadbands are still cheaper than mobile 3G/4G data. So it makes sense to differ not so urgent work for later, to be done once at home, than doing everything from mobile on the go. Every home that owns 2-3 smart phones also has a broadband connection. Once people start terminating broadband connections and start relying fully on mobile internet, app only model may start to make sense. 4. Mobile apps drain your phone's resources. I would want the apps to remain in hibernate mode and come to life only when I want them to, but all apps assume that I am very happy to keep updating them every now and then, keep checking them out whenever they announce new offers (which is almost every day). Too many apps slow down the phone, drain battery, increase data bill and also annoy you with frequent notifications. If I am shopping just say once a month, then why should I have so many apps in my phone? I prefer to use the web version. 5. Customer acquisition cost on app is much higher. Majority of apps get their users by means of heavy incentives- like App only discounts, free rides on sign up, free credit, referral bonus etc. Many customers have installed apps hoping to save a few hundred rupees, not necessarily because apps are the best way to shop. Given an option to select between a big screen laptop vs small screen mobile, I am sure many would prefer the bigger screen if all other aspects like price, speed etc are same. Majority of the e-commerce sites haven't made any profit yet and to keep rolling out incentives to continue using the app could be a costly proposition in long run. 6. It may take several years more before desktops and laptops become redundant. Desktops/Laptops are still primary device in all offices, so it takes long time for them to be replaced. Even at homes, if I have lots of typing to do, movie to watch and do other traditional stuff, laptops are still more practical than mobiles. So it may be little too early to close down a complete revenue channel- the e-commerce website and go app only. I read that for most of the sites significant proportion of sales are coming from mobiles- this is good but it could be partly because of additional incentives offered for shopping on mobiles. Is it wise to shutdown the web completely and rely on app alone? After another 5 years may be yes, but in my opinion, right now is not the best time. Instead of looking for statements that can get some media lime lights, companies like flipkart should now work on making some profits in a fair play environment (no investor funded discounts, app only offers etc). Flipkart is spamming customers with promo emails. They should stop that first and send notifications via app only. Update: Today evening I wanted to check price of a spice phone. Tried opening flipkart.com on mobile and it didn't open. On a mobile device, it was forcing me to download app. I didn't want to do that. Opened Amazon instead. What are your thoughts? Given all parameters like cost, speed etc are same, do you prefer to shop on app or on a big screen laptop/desktop? I would choose computer only. For me, such a process will decrease my interest in Flipkart a lot, and I will shift to Snapdeal/Amazon or any other. It is fine for Myntra and its fashion, but for buying these small household things and books regularly, I would need the computer because it is easier to keep checking. Totally agree. And the other thing that app-only companies are discounting is that inspire of the brilliant UX in the apps, a whole bunch of the older generation (currently 50-65 age group, who have good purchasing power) is finding it impossible to use these services simply because of the app only existence. I don't have specific numbers for this, but I am sure this segment of the population has enough business contribution so as to not be ignored. My 2 cents. Thanks Teny and Vatsala for agreeing. Yes, senior citizens who are getting familiar with computers will need some more time to get accustomed to mobile shopping. I totally agree. Using a computer to place orders online rather than apps are more comfortable. I completely agree, it is in very nascent stage to go completely app. Particularly point number 5 totally agree they forced us to buy through app to get more discount. Recently Flip kart had app only discount we checked all the details of MI Tab it is Rs.12999 in website checked all review and bought in app for Rs.10999 saved Rs.2000. The same did for PAYTM for foot massager. Even I feel very uncomfortable shopping thru Apps. 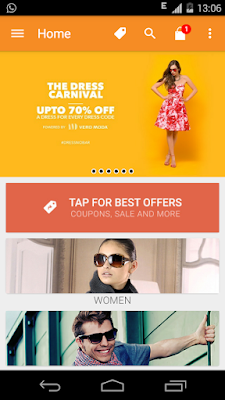 If flipkart goes App only, then I may stop shopping in that.